Almost four years ago, after the untimely demise of our start-up business, we came to a place of rebirth. Previously, we had moved closer to Mama’s family in Florida in order to get married and start our family. After purchasing and old wood framed two-bedroom home in a blue-collar town, we embarked on an odyssey of home renovation and family building. Through our efforts at reconstructing the house, we attained fantastic equity in the burgeoning real estate market. Costs were kept down by my scavenging the construction sites I worked on and my willingness to do all the work myself. Before the real estate bubble burst, we transferred the equity in our home into the creation of our dream; a restaurant, where our years of experience in the industry could be put on display and we would become financially independent, at least that was the plan. We worked hard for 1 1/2 years to achieve success in the eyes of the community and critics alike, but financial success never came. Unbeknownst to us, we were riding the economic collapse of 2008. Friends and family came in to help with cash and volunteer hours (a million thanks). We threw in my inheritance from my Latvian grandmother. We gave it our all. The short story is: we lost the home and business in the black hole of economic reality. We took what jobs we could find and started saving as much as possible. Thoughts of moving to a more rural setting filled our heads and we started to make plans. Through purchasing Mortgage Free! 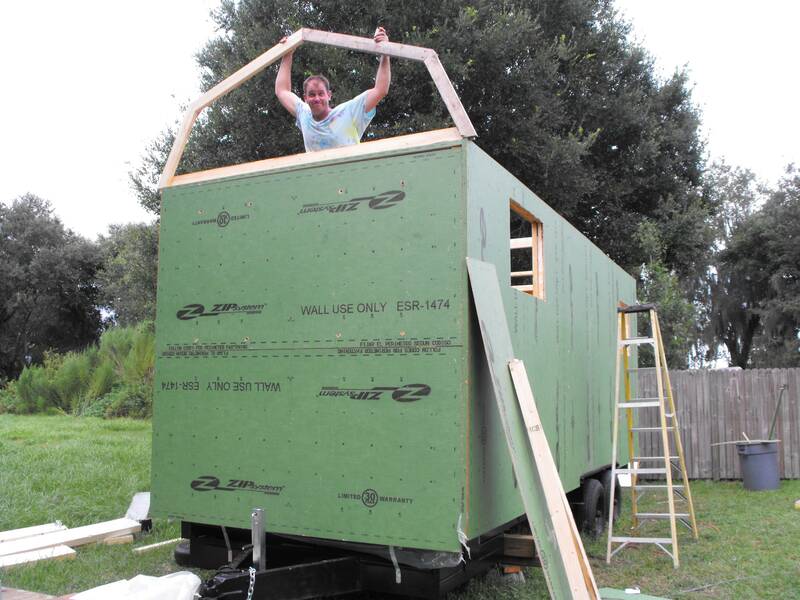 : Innovative Strategies for Debt-Free Home Ownership , we came across the basic idea of finding the best land we could afford to buy with cash, and then live in a temporary shelter while we built our larger home. Temporary or not, we knew that we wanted a decent quality of life from the structure. We were challenged. How could we do this quickly and with cash? When I found tinyhouseblog.com, I was inspired by the ideas and immediately started designing our mobile mansion. I for one am glad you all 4 found your way here. You guys are an inspiration. I like the word rebound. Thanks for the comment, Dennis. So wonderful to see what you are building, both for your family and in your family. I’ve always loved Mama’s spirit and miss her smile, but it’s inspiring to see what you are all doing for yourselves! 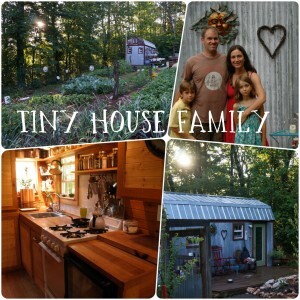 Hi, I love your tiny house… and am interested in building a similar one myself. Would you be willing to share your house plans with me? Just found your blog today and WOW! We have been riding the shame wave for the last 2 years after filing bankruptcy due to failed business debt which included losing both houses we’d had (we’re a mine and his family) due to a renter who trashed one and a failed foundation on another. We’ve been all cash since. We’re renting right now but our dream is to buy country ground and build as we can. I salute you for living in such close quarters with your kids as our 4 boys drive me crazy in our smallish rental! 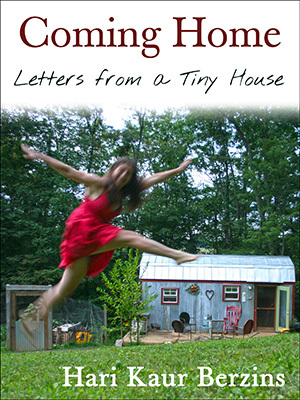 I look forward to reading more about your journey and your tiny house. Thank you, Melisa! Down with shame. So glad to know you have moved to cash only. So freeing! Best of luck on your rebound. Wishing you peace. So many people have come to the point of losing homes, jobs, relationships; everything. That you have made the most of a bad situation and modified your lifestyle to suit the changing playing field shows your dedication to doing the right and important things, even if it feels like you’re stepping out of your comfort zone at the beginning. It’s closing in on the time when most of us are going to have to make drastic changes in the way we live. I know my wife and I have and we love living with less stuff in a smaller place. I wish you continuing luck in making smart steps in the right direction. Thanks for your comment! We hope to ease the pain for others going through these struggles. It can ALL be an adventure with the right perspective. I just found your blog/website after weeks of research tiny homes. My husband and I are in the process of foreclosure of our home. We completed bankruptcy earlier this year. We are looking into building a tiny home on our 3 acre rural property. We have 5 boys (four live at home) so we need to do this right. I am inspired by your story and thankful you are sharing your experiences. I am also so relieved to see that we are not alone in our journey and many have paved the way. Thank you and bless you and your family. The whole thing is heartbreaking, but creating your own recovery plan is very empowering. I wish you the best! It gets easier. Thanks for sharing. Thank you, Debbie! It’s so nice to read your encouraging words. Be well! Saw your story on YouTube and truly inspired by your family. My husband and I live on the east coast and are very interested in a buying a tiny home and land with it. The only thing we’re finding is there isn’t a lot of info online. Anyhow I was wondering if you have any tips or sites you found useful in during your process? Thanks so much! Hello. I have been fascinated for some time of the tiny house idea. I have actually lived in a 500 sq ft home years ago before I was married and children. I actually spent a year of college living in my VW bus. I now live with my 3 year old daughter. My wife divorced me two years ago and during that time my grandparents went into a nursing home. I now live in their very large home. Cash is non existent in my life including credit. I have been looking for a tiny house idea when I saw you and your family living in this small space. Wow I love it and I am inspired to keep searching for the possibility of finding atiny home and a small piece of land. Thanks for all you are. Kudos! It is an inspiring story! Kudos- it is an inspiring story/lives! 17′ diameter octagon. Kitchen and bath were shared between several homes. Years ago, a rural friend said her ideal for teen years would be several small units with shared dining in a hub- tiny houses would be perfect! Perhaps a couple of gender specific bunk houses! You didn’t look for a government handout…you looked to yourselves for a way out. You’ve earned a priceless education. Tough as it is…you will survive and be better for it. Tough times teach us WHO we truly are. They teach us HOW we can find strength we didn’t know we had. They teach us WHAT we can live without. In the end, you’ll be proud of yourselves for what you’ve accomplished. Way to go!!! I applaud you!